Kadamban Movie Review: Kadamban is the latest epic action drama film featuring Arya and Catherine in the lead roles. The movie was written and as well as directed by Raghava. R.B.Chowdary bankrolled the kadamban project associating with B, Suresh, B.Jeevan, Jithan Ramesh, Jiiva and Arya and distributed by The Show People. The production company of the film is Super Good Films. Here is the Arya’s Kadamban movie review. Kadamban means a masculine boy in Tamil. Just by looking at the poster itself we get a clear vision of who Kadamban. Arya played the role of Kadamban, a tribal boy. Beautiful actress Catherine Tresa played the role of Rathi.The film focuses more on the forest and how important forests are. Arya, himself is the biggest highlight of the movie. His masculine body tells us how much effort Arya put in and the hardships he faced in building that body. As the character needs it, Arya spent most of his time with elephants which are hard to handle despite the training. Catherine Tresa for the first time is playing a character like this but did a convincible job. She showed a different level of her acting skills. Madhuvanti Arya did a good job in the supporting role. Forest protection is one such initiative which is necessary but often neglected. The direction/writer Raghava did a good job bringing that point into the light. Cinematography by S..R.Satish Kumar is excellent. Music by Yuvan Shankar Raja suited the scenes very well. Art Director A.R.Mohan did an appreciable job. Stunts choreographed by Dhilip Subbarayan are astounding. #Kadamban: Arya's best in recent times. He's much better as an action hero and should do more of it. Climax in particular, very neatly done. 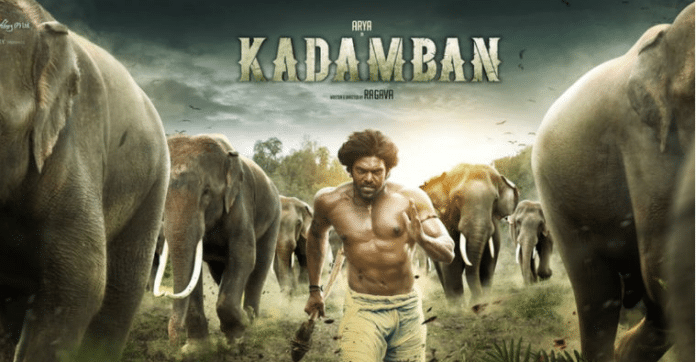 Finally, Kadamban is one such unique film that focuses mainly on the forests and their value which makes it a beautiful ride. Watch the Indian Jungle Book in Theaters this weekend.